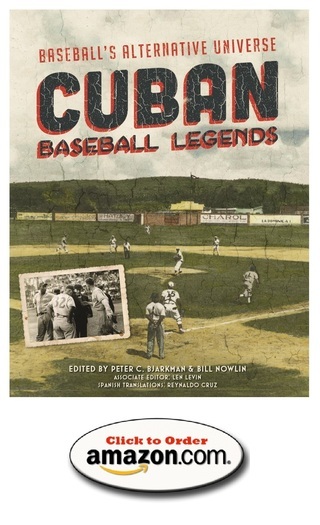 Pioneering bilingual editions (English and Spanish volumes) edited by Peter C. Bjarkman and Bill Nowlin and drawn from SABR Biography Project archives on legendary Cuban ballplayers. Features portraits of many of Cuba's most legendary pre- and post-revolution stars. "A celebration of the powerful grip that America's game has on its millions of fans, and an attempt to recreate baseball history as it lives in our memory and imagination." Early Bjarkman coffee table pictorial team history volumes include books on the Toronto Blue Jays, Brooklyn Dodgers, Cincinnati Reds and Los Angeles Dodgers (the latter pair published in the Brompton Book's "Baseball Great Dynasties Series). An ultimate guide to the top figures (on the court and off) timed for the sports collegiate centennial and also covering the first half-century of the professional game. The composite story of American collegiate basketball, written on the occasion of the sport's centennial and later reissued in an attractive paperback edition. Colorful review of one of pro basketball's most-storied franchises, focusing equally on the Russell-Cousy-Auerbach unparalleled dynasties years during the strife-torn Sixties and the rebirth of glory under Larry Bird and Robert Parrish in the Eighties and Nineties. A quintet (appropriately enough) of pro and college basketball volumes representing the author's free-lance work in the final decade of the 20th century, before the siren-call of baseball in Cuba. A collection of additional baseball and basketball volumes edited by the author, plus major contributed chapters and a handful of volume "introductions" contributed over the years. Bjarkman's several dozen SABR BioProject articles (on-line and forthcoming) are all linked here (Cuban and Japanese players). The author's Bios for Cuban big league playerss are also linked above on the separate Cuban Baseball Legends book page. Drawing from a large collection of on-line SABR Biography Project essays featuring memorable and even legendary Cuban pre- and post-revolution ballplayers (many of the articles penned by Bjarkman) the editors have provided a volume exploring the historical depths and colorful past of baseball of the Caribbean island nation. Launched as a pair of volumes (English and Spanish, with translations by Cuban baseball enthusiast Reynaldo Cruz of Holguin) these books are available in paperback and e-book formats and can be purchased on-line directly from the SABR Digital Library and the SABR on-line store (www.SABR.org). Further details about the Spanish-language edition are found on the BJARKMAN IN SPANISH section of this website (found in the right-side column). These ground-breaking English and Spanish editions (SABR's first-ever such effort) capture the mystique and colorful history of Cuba's unparalleled baseball saga across the 20th and 21st centuries. Also featured are several background essays by Bjarkman providing the necessary background on Cuban baseball lore, including a history of the post-1962 Cuban League and Bjarkman's detailed essay on the baseball contribution of the island's half-centurt leader and revolutionary icon, Fidel Castro. These ground-breaking English and Spanish edition (SABR's first-ever such effort) capture the mystique and colorful history of Cuba's unparalleled baseball saga in the 20th and 21st centuries. Also featured are several background essays by Bjarkman providing the necessary background on Cuban baseball lore, including a history of the post-1962 Cuban League and Bjarkman's detailed essay on the baseball contribution of the island's half-centurt leader and revolutionary icon, Fidel Castro.